Just getting to Shenzhen is an adventure for a different post, but the Hackaday crew made it and spent our first full day in the city last Thursday. Unlike Wednesday’s experience in Hong Kong, most people you run into do not speak English and the signs generally don’t have English words on them. This makes getting around hard in that it’s difficult to figure out where it is you’re going. It’s equally tough to convey the destination to a taxi driver or translate it into public transportation. I was able to get to the Software Industrial Base via taxi because I had saved the Chinese character address on my phone and showed it to the cab driver. But when the trip ended I had trouble figuring out how much to pay… the meter reads 10 Yuan but there is an additional charge of a few Yuan which I only realized in retrospect. But my driver was very nice about this and helped me with change and a smile. You might think finding the correct building would be simple. But the Shenzhen Industrial Software Base is a huge complex of similar buildings. A friendly security guard looked at my saved address and used the squares in the sidewalk as a map to non-verbally get me headed the right way. Seeed Studio, our hosts for SZMF, have a beautiful new office which is industrial-modern in its decor. There are glass-walled conference rooms but the majority of the space is open in design as it wraps around the exterior of half a floor in the six or seven story building. After doing some planning for the Hackaday workshop the next day, [Chris] from Seeed offered to take us to the electronics markets. How do you pass up that offer? We first stopped off at a Korean restaurant for lunch, then hopped a slightly-crowded cab to meet [Matt] and [Alek] who were already at the market. The Huaqiangbei markets are multi-story buildings filled with booths. We first went into the wrong one, which turned out to be the used equipment building. Vendors specialize in refurbishing electronics. There were floors and floors of booths filled with equipment — often three tiers or more of laptop computers (open and running) wrapping each booth which were about the footprint of a king-sized bed. Back on track we made it to a brand new building which was seemingly built already completely packed with booths. The place has everything, generally divided up by floor. The top two floors are mostly LEDs of every kind, or drivers for them. We were on the hunt for addressable LEDs, but there didn’t seem to be any legendary bargains available. This may have been an issue of volume because I later heard from a friend that he acquired 25-meters of 12V WS2812 strips for a song. Next it was the hunt for the “baby phone”. This is an Android phone built to look like a miniature iPhone. They’re cute. The blocks, and blocks, and blocks of walking, backtracking, running into acquaintances who joined the hunt, and finally ascending shady stairs and dingy aisles did pay off. Ta-da, [Sophi’s] new phone! We hopped the subway to get back from the markets. I love trying out public transportation in different cities and this didn’t disappoint. The stations are so clean, and after 85 degrees F and 80 percent humidity all day the air conditioning is heavenly. You purchase a token which is a green plastic disc about the size of two american quarters stacked on top of one another. Very light weight and very tech-oriented. Each is an RFID (or some other non-contact) tag. Tap it on your way in, drop it in the slot on your way out. Midway during our return trip we realized we were changing the location for Hackaday’s Saturday Shenzhen Meetup. We got off the train, rode the other way, switched lines, and popped out in a beautiful part of Shenzhen. Everything in this city seems to be new and under construction. NYPD Pizza is in the middle of a very partially completed complex but has the hip, trendy, divebar-neveau that made for an awesome meetup. Check back on that yarn which deserves it’s own post. A bit exhausted, we made it back to the hotel for a bit of dinner and relaxation. But who could pass up the opportunity to head to an outdoor BBQ party marking the end of Hacker Camp? This creation, started by Hackaday Alumni and Dangerous Prototypes founder [Ian Lesnet], invites engineers and hardware creators to come tour Shenzhen and pick up as much manufacturing knowledge as possible in between epic evenings of socializing. Again, figuring out where to go is really hard! We jumped on the subway and made it to the correct stop, but getting to the BBQ alley in what feels like a residential neighborhood required a aimless wandering, and bumping into two different people who had already been to the party. The atmosphere was sticky and blazing hot. Everyone was dripping with sweat and drinking a very large beverage. Check out this hi-res album for the proof. There were a few restaurants, an open-air bar, and a bodega with bombers of Tsingtao for under a buck (USD). To me it seemed to be a dead end street, but every few minutes a honking motorbike was waddled through the shoulder-to-shoulder crush of sweaty bodies. Hardened ex-pats and locals drank beer from glasses, but the foreign visitors seemed to stick with bottles. This definitely registered as one of the most exciting days of my life. I love the adventure. The city feels safe and friendly — but travel (especially at night) adds a thrill. 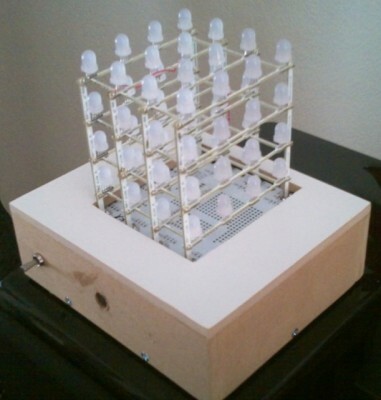 [Craig Lindley] recently finished building his own RGB LED cube project. It’s made up of four layers of 4×4 LED grids, but you may notice that the framework that supports the structure is not the usual ratsnet of wires we’ve come to expect. They’re actually long, thin circuit boards. [Craig] grabbed the Rainbow Cube kit sold by Seeed Studio for this project. But instead of pairing it with their Rainbowduino driver, he built his own to give him more options on how to control the blinky lights. He’s using an Arduino Uno to control the display, choosing TLC5940 driver chips to safely provide the juice necessary to light up the grid. These drivers also offer 12-bit pulse-width modulation for easy color mixing. Driving the LEDs directly would have taken a large number of these expensive chips (over $4 a piece), but if multiplexed the design only calls for two of them. Check out a video of the finished cube reacting to music thanks to the microphone and amplifier circuit [Craig] build into the driver board. ArduinoArts is animating an inexpensive Ikea lamp as a contest entry. Seeed Studio’s Toy Hacking Contest calls for the competitors to work their magic using the Grove Toy Kit, which is an extensible sensor connection system for the Arduino. Most of the items in the kit were used to add interactivity to the lamp. Check out the video after the break to see the motion that two servos provide. The lamp can move its shade back and forth as if shaking its head, and the whole arm assembly can rotate in relation to the base. The sensors detect when you’ve repositioned the lamp head and the device will yell at you if it doesn’t appreciate its new pose. It also reacts to noise and motion, switching on the LED that replaces the original bulb in both cases, and asking: “Are you Sarah Connor” when motion is detected. These basic modifications really make for some fun animatronic behavior.